It never fails. You fill up your car on the way home from work only to see it for $.10 cheaper per gallon at the next gas station. If this consistently happens to you, it doesn’t have to as there are a number of ways to save money on gas. One of the best options to get cheap gas is through gas-finder apps. Depending on how much you drive, lowering your gas costs is one of the best ways to save money each month. The average price of gas nationally, as of this writing, is $2.62 per gallon, according to the U.S. Energy Information Administration. That can add up to a lot of money if you drive frequently. Even if you manage to save $20 per month on your fuel costs, that amounts to $240 annually you can apply to other needs. It’s easier than you think to find cheap gas. In this post, we’ll discuss how and where you can find the best savings. In fact, it’s as simple as using your phone. If you want to know how to find the closest cheap gas, this post shares how to use your phone to save money on gas. Do you often ask yourself, ‘how can I find a cheap gas station near me?’ and not know where to look? Below are the seven best apps to find cheap gas and save money at the pump. GasBuddy is one of the best cheap gas apps around. Not only does the app offer you a map and shows you what gas station has the cheaper price, it also estimates the gas costs on a trip you plan on making. For example, my family and I used GasBuddy when we drove from Kansas City, MO to Cape May, NJ. All we had to do was enter in our destinations and some details about our car (make, model, etc) to receive the estimate. GasBuddy told us we would spend around $120 on gas each way, and it was fairly accurate as we only spent around $112. In recent years, GasBuddy has started a program called “Pay with GasBuddy” that connects to your bank account and gives you a card to use exclusively for gas savings. GasBuddy offers real-time pricing data from over 150,000 gas stations nationwide you can use to find cheap gas. The Waze app isn’t just an app to help you get cheap gas. It also provides directions and traffic information in real time. Both the app and the website have a “live map” option where you can see what’s going on in your area. It offers the best routes to avoid traffic, and how long it’ll take to get to your destination. To find the closest cheap gas using Waze, search for gas stations in your area. The app will provide all of the information you need, including the best route. Then, you can choose which gas station has the cheapest option and fill up. Gas Guru is a great app if you need to filter gas by type and distance as well as price. For example, GasBuddy seems to only show the “cheapest” prices. But if you’re driving a car that requires diesel fuel, you may get stuck with the gas station that charges more for diesel. Another great perk is the ability to search by distance. As much as I love getting cheaper gas, I don’t want to drive 30 minutes away just to save a few cents. The app helps protect against that by providing the last time the gas price was updated in the app. If it was updated more than a few days prior, you might want to consider another station. Do keep in mind that Gas Guru is only available on Apple-based devices and does not currently work on Android devices. If you use MapQuest (like I do sometimes), take advantage of their free app to get cheap gas. Aptly named Gas Prices by Mapquest, the app lets you create a customizable list based on type of gas so you don’t have to waste time wading through lots of results. If you commute to work, you can enter your regular route and the app will automatically update pricing before you leave. You can even add features to your route for other needs you may encounter like stopping at the store or a restaurant. The app is available for both iPhones and Android phones, so anyone can use it. FullTank is an app that lets you find cheap gas nearby whether you’re in the U.S. or overseas (yes, it’s international). You can search gas stations by their address, calculate your gas savings, and even calculate monthly savings. If you like seeing a breakdown of numbers and the savings you can rack up, FullTank is the perfect app for you. Plus, it’s free to use. The Dash app claims it can turn any car into a smart car. While the app itself is free and offers basic advice like gas price information and vehicle pricing, there is a helpful device you can use to turn your vehicle into a true smart vehicle. The device is easy to install and takes less than five minutes. The OBD device is great for older cars, especially relative to gas prices. It helps you make necessary adjustments to make your car more cost-efficient, saving your even more money. For example, if your car is having issues that you are unaware of, but you’re noticing that you’re getting less miles per gallon than you typically do, it could signal a problem that needs a look. If there is an issue and you get it fixed, you’ll save on gas and your car will be more efficient. Plan on going on vacation or a road trip any time soon? If so, you need the AAA TripTik Planner app. You’ll be able to find cheap gas prices, get travel directions, and plan your entire trip online all in one easy-to-use app. Just make sure you print some maps to accompany the app just in case your phone loses power or service during your trip (you should actually do this any time you’re traveling somewhere unfamiliar). TripTik offers access to real-time data at over 100,000 gas stations, according to their website. If you’re not a AAA member, you can use the app, but you must be a member to use each feature the app offers. Like Gas Guru, the TripTik Planner app only works on Apple based devices. Just like you can receive discounted gift cards for restaurants and stores, you can do the same for gas. While you won’t save a lot of money, you may be able to save a few extra cents each time you fill up. This is also a great gift to give to the person who drives a lot. Have you ever passed by a gas station on your way home from work and promised yourself you’d fill up tomorrow, but then in the morning the gas is far more expensive than it was? You’re not crazy, or alone. Prices for gas fluctuate often, sometimes even daily. Sundays and Mondays are the best time to fill up, while Thursdays and Saturdays are the worst, according to GasBuddy. So before heading to work on Monday morning, fill up the car. If you don’t, you may regret it later in the week. If you live near a Costco, you may be able to get cheap gas through their gas stations. This is one of the best Costco hacks if you regularly pass the warehouse store. It isn’t guaranteed that you’ll save money, especially if you factor in purchasing a membership just to save. But if you already have a membership and stop for gas often, it could save you a few cents every fill-up. If your local grocery store offers gas perks, you could save big on gas just by purchasing groceries. While many of these grocery stores do require a loyalty card, you can typically receive these for free. For example, because I live in the Midwest, I have the option to shop at our local Hy-vee and they offer a perks program. Every week I scour the ads to see if what I need also matches any gas perks. If they do, I grab the items and use my loyalty card to get the perks. I’ve been able to save up to $.20 a gallon just by purchasing groceries I planned to buy. Again, this won’t work if you’re overspending just to save on gas, but it can be helpful if you receive the perks while getting what you already need. If you use an app like Ibotta when buying groceries, you can double dip and save even more money. Under inflated tires means your car is less efficient, resulting in using more gas. Check your tire pressure every few months to ensure they’re properly inflated. Speaking of efficiency, you should lower the weight of your car. If you store lots of items in your car, that costs you more in gas. Find another place to store your stuff, or get rid of it completely. Gas is expensive, but there are ways to save. Between the best cheap gas apps and tracking gas price fluctuation, you can get cheap gas and save some money. If you’re constantly filling up, have a gas guzzler, or just want to find easy ways to cut costs, gas apps are a great money-saving solution. Just imagine what you could do with a few extra hundred dollars per year. What are other ways you use to get cheap gas? How much money do you spend on gas each month? What cheap gas apps do you use to save at the pump? 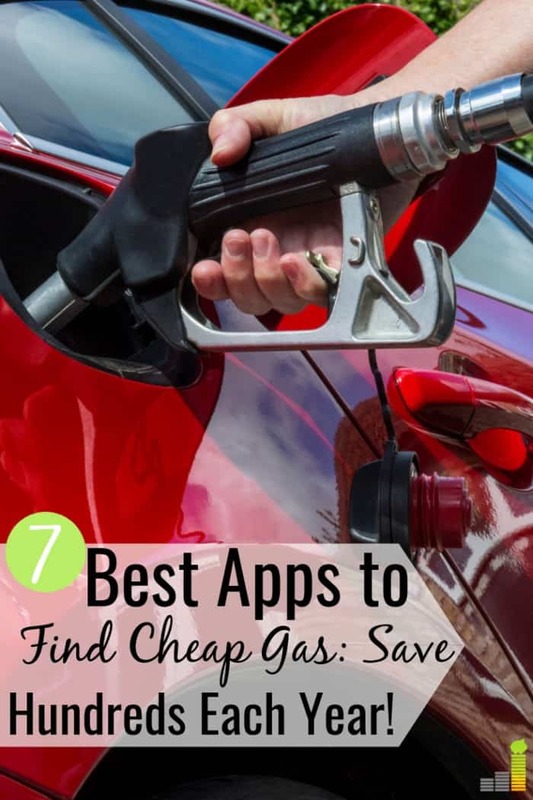 The post 7 Best Apps to Get Cheap Gas Near Me appeared first on Frugal Rules.